The Explorer II is always accompanied by a durable waterproof Oyster case as well as a highly visible dial topped with lume and a resilient stainless steel finish. Tough yet reliable, the Explorer II more than lives up to its name as an adventurer's watch. As a Rolex timepiece, this functional tool-watch also maintains the luxury status that the Rolex brand is known for in the form of a COSC certified perpetual movement and high-quality materials. 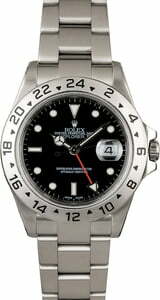 Every Rolex Explorer II is worth the investment. This particular ref. 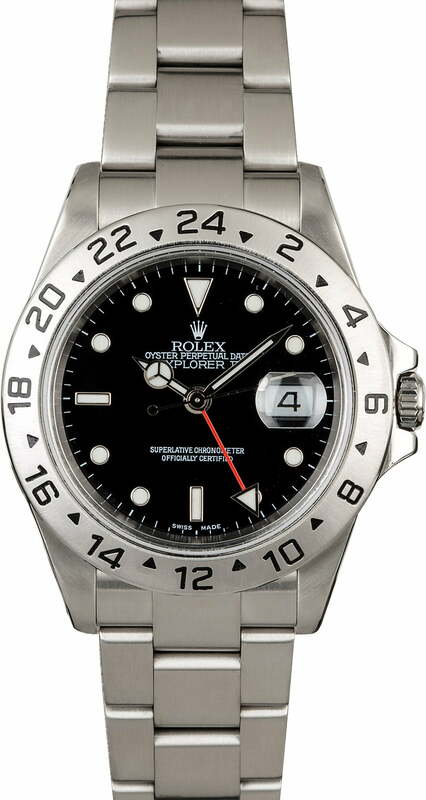 16570 pairs the brushed steel finish with a contrasting black dial. A red GMT hand pops against the dial and can be read against the fixed bezel to sync with military time as well as track day and night hours. Worn on a flat-link Oyster bracelet secured by a folding Oysterlock clasp, this men's Rolex will offer a comfortable hold no matter where your adventures take you.